ASUS ROG G501JW Review - Notebook gaming is one of the segments that are dynamic and very interesting for a wide range of vendors who compete in business notebooks. The reason is, users concerned with gaming segment in the latest technology, best quality, highest speed and a very satisfying playing experience. They are not too much considering the issue price. As the owner of ASUS brand Republic of Gaming, innovating with presenting the ASUS RoG G501JW that has a high specification but with a body thin. The ASUS RoG G501JW is gaming notebook with high performance, armed with processor Intel Core i7-4720HQ with Turbo up to 3.6 GHz, 16 GB RAM, 128 GB SSD DDR3L plus 1,000 GB HDD for data storage. 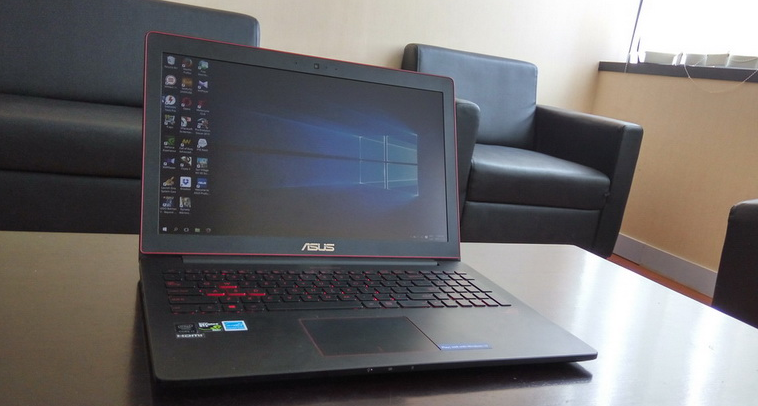 In terms of graphics, Asus notebook G501JW provided the graphics card NVIDIA GeForce GTX 960M with 4 GB of GDDR5 memory. Surely the very specifications of gahar, certainly the Games present could be run easily by the gamers. This notebook will be favored by gamers with high mobility who need a gaming notebook thin but still powerful. The presence of the ASUS RoG G501JW inspired by the design of the Zenbook, with thin black aluminum-coated body that presents luxurious impression. The motif of vertical lines like strokes of metal on the back of the monitor gives the impression of sturdy. If seen from several different angles, aluminum panel on the cover of this notebook gives a reflected light Shimmers an extremely luxurious. With thickness 20.6 mm, and weighs only 2.06 Kg, the ASUS RoG G501JW is one of the thinnest gaming notebook in its class. ASUS RoG G501JW designed specifically for gamers, reinforced by high end components that are best in class can be sure for now. Behind a thin and light design, the ASUS RoG G501JW save processor Intel Core i7-4720HQ Quad Core, 8 threads generation Haswell which have very small numbers in architecture 22 nm and has a high frequency up to 3.6 GHz with intel Turbo Boost Technology. The performance of the processor the gahar combined with 16 GB of RAM DDR3L Memory capable of devouring the best multitasking computing. As storage media, ASUS gives SSDS and HDDs at once on this computer, in the form of an SSD supports port PCIex4 which has faster speeds twice in comparison with a standard SSD working in number 505 Megabytes per second. So that the data transfer speed of SSD can achieve 1140 Megabytes per second. ASUS RoG G501JW any other full-size chicklet keyboard, which features a backlight and a short press of 1.6 millimetres which ensures the comfort of users in play. Not only that, ASUS also pays attention to the needs of gamers, therefore, ASUS add a special button to facilitate users while WASD to play in a Dim room. In terms of multimedia, gaming notebook, the ASUS graphics card is equipped with NVIDIA's GeForce GTX 960M high enough competitors with Nvidia architecture Maxwell at 28 Nm and 4 GB memory GDDR5 128 bit, 5,000 MHz designed to support the weight of the game. The graphics card has a higher clockspeed at 1,096 MHz to 1,202 MHz complete with 640 shader units. With the middle class graphics card specs, of course heavy games, launched in 2014/2015 this could run with the maximum resolution and detail. In addition to high performance, this graphics card also supports HDMI port 4K2K output if you want to combine with the monitor or play on a bigger screen with a maximum resolution, it is rare we find on other notebooks that are generally only provide external HDMI port which is only capable of providing resolution QHD only. Uniquely again, the ASUS RoG G501JW also features additional display output mini display port allowing the notebook is to be connected with two screens at once, so that the user can use three screens at once in total including screen notebooks and is suitable for you who like to play games like Flight Simulator or car racing game by positioning the camera in a vehicle to make it look realistic. ASUS ROG G501JW Download Free - You can download many drivers ASUS ROG G501JW in our blog, as the Touchpad driver, Vga driver, Audio driver, Wireless driver and Bios update, without direct to other sites, so you can save time, and also without viruses and malware. Chipset Type : Mobile Intel HM87 Express. Installed Size : 16 GB. Monitor Features : ASUS Splendid Video Intelligence Technology, WideView, Zero Bright Dot, anti glare. Diagonal Size (metric) : 39.6 cm. Display Resolution Abbreviation : Ultra HD 4K. Graphics Processor : NVIDIA GeForce GTX 960M / Intel HD Graphics 4600 - 2 GB GDDR5 SDRAM. Video System Features : NVIDIA Optimus. Wireless Protocol : 802.11b/g/n/ac, Bluetooth 4.0.